The reason why we are seeing profit taking at that level should be clear: that 1,882 is the first target of the “busted” setup we saw at the lows at the beginning of February. That level, that in the chart above is the 1,728.75 (according to the levels of the continuous contract aligned to the June expiration) was 1,735 in the previous contract expired in March. Apparently, weekly bulls and long Program Trading was not able to sustain price above the stop level. This si always a warning sign and a good reason to anticipate selling when price gets to the first target. This target is indeed the 1,882 level mentioned above and this explains the reason why we are seeing weakess, i.e. Program Trading selling at those levels. What can we anticipate for the near future? The 1,882 is clearly a level where professional and Program Trading has been selling so far. If price continues lower we could see a retest of the 1,809 area, which I have now indicated with a broken blue line. The line is broken because we have already tested that level and second tests are always dangerous tests. 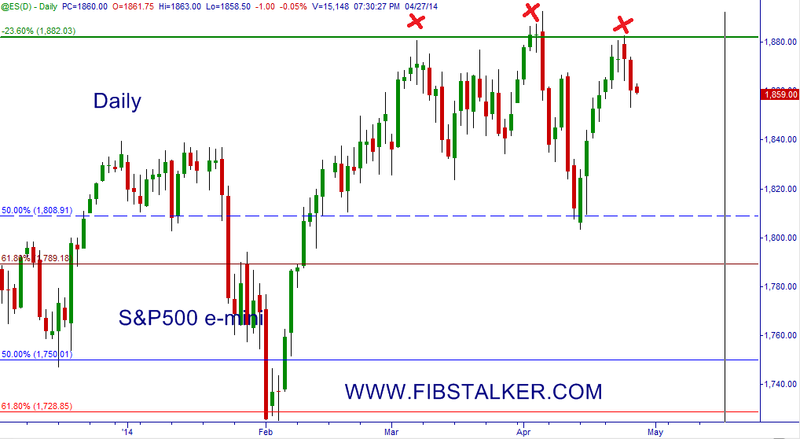 If price gets there there is a possibility of the S&P500 futures to just slip below it and below that 1,789 level. If that’s the case a retest of 1,750 and even much lower prices could actually materialize. On the other hand, if price bounces again from here there is a possiblity for a new retest of 1,882 that could see renewed selling. I am going with the first scenario for now and looking forward for a retest of 1,809. The FibStalking timing technique and the the FibStalker method help “level plain” the trading game showing what banks, institutions and big hedge funds are actually doing (and not what they are saying they are doing). Learn how to spot the Algorithmic Trading footprints. I send a free Newsletter in the weekend and provide updates throughout the week. The newsletter typically includes 3 video reviews for (1) EUR/USD, Dollar Index, S&P500 emini and Gold emini; (2) the Japanese Yen majors, i.e. USD/JPY, EUR/JPY and GBP/JPY; (3) the other majors: GBP/USD, AUD/USD, USD/CAD. Those who want receive it are still in time as I sent the previous 6 issues to all the readers who register. So, go ahead and register here to receive the free weekly newsletter. If you like this article, feel free to share it with your friends and fellow traders. Have a great trading and non-trading week.